I am fascinated by container gardens. From small boxes to huge ceramic pots, anything can be used to plant flowers in. 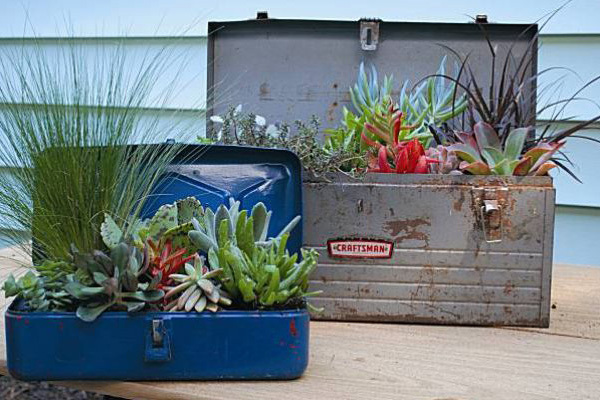 I am especially in awe of recycled items that can be turned into container gardens. This is a great idea for a funky garden. 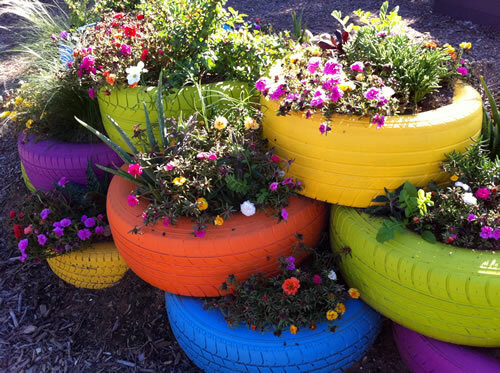 Recycled tires painted bright colors and filled with beautiful flowers and plants. I love the idea of turning something that would otherwise take up space in a landfill into a useful, quirky and delightful garden. Note how the colors of the flowers coordinate with the tire colors. How many children’s rain boots have you tossed out? Isn’t this better idea? It could easily become a great afternoon project with the kids. Try planting seeds and let the kids watch the flowers bloom. Every once in awhile old metal tool boxes can be found at flea markets, or salvage shops or your neighborhood tag sale. Turning one into a garden is a fabulous idea. All it takes is a little imagination and anything that has three sides and can hold dirt can be turned into a container garden. I’m thinking the boots with herbs along the front porch railing … easy to get to, easy to keep drained and such a wonderful array of fragrances. There is a thrift store outing for kids boots in the next few weeks. Boots are cute but the tires and metal boxes push the limits. Not sure I could see looking at old tires in my neighbors back yard even in the eclectic yards.